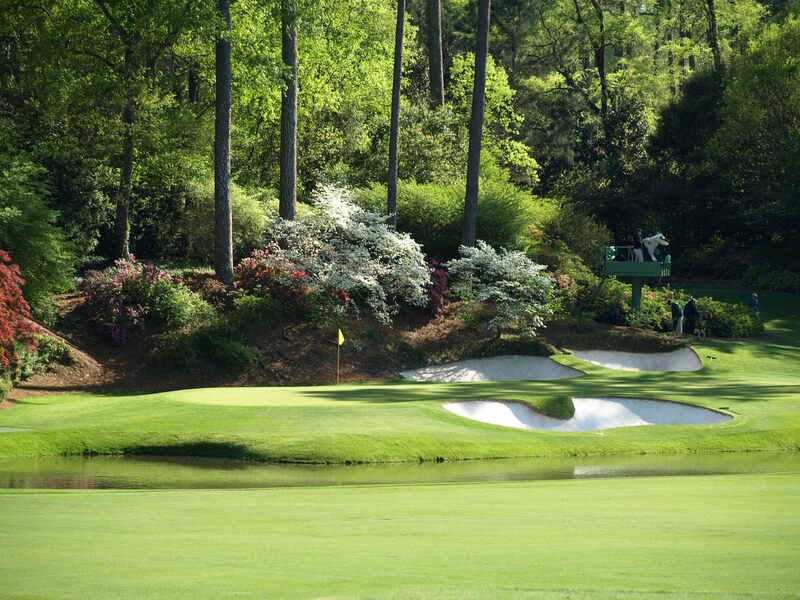 I will make this clear from the beginning, this look at Augusta National Golf Club, is purely through the eyes of a patron attending the Masters. I have not played the course (can only dream of that), but did gain a good insight during my visit and through the many books I’ve read. Augusta National Golf Club is located in Augusta, Georgia. 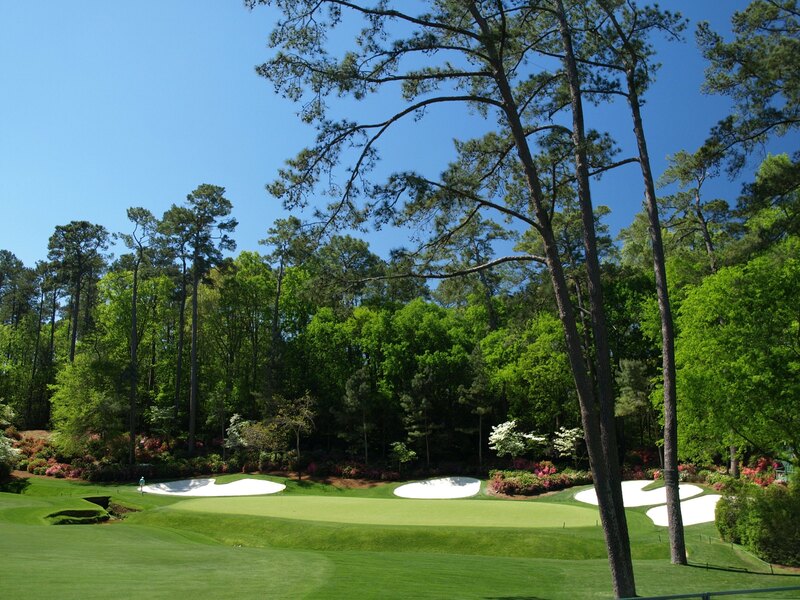 Founded by Bobby Jones and Cliff Roberts in 1932 and designed by Dr Alister MacKenzie, the original aim being a truly national club, as well as a winter retreat to play golf with his friends. The site was formerly an indigo plantation, abundant with fauna. This helped in the decision that every hole be named after a plant or shrub. These were originally planted by Louis Alphonse Berckmans, son of the original owner of the land, along with Bobby Jones and Clifford Roberts on each hole. The current clubhouse was built originally in 1854. There are many cabins located on the land, including Butler Cabin (the Masters champion is presented with their green jacket), Eisenhower Cabin, used by the President of the USA during his visits and the Crows Nest, used by amateurs invited to The Master tournament. There are actually two courses located within the grounds. 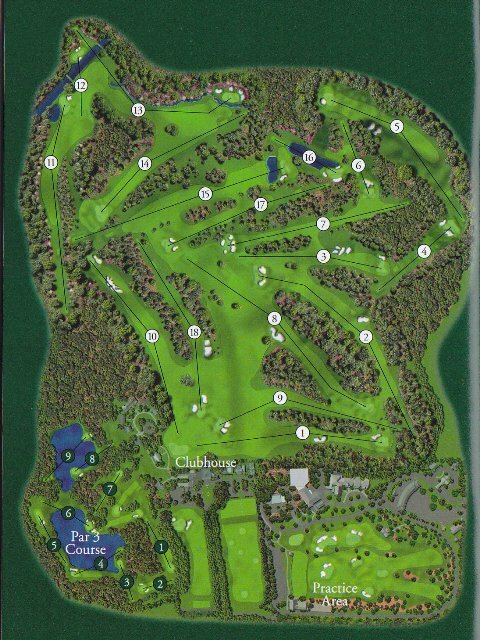 The 18 hole championship course as well as a nine hole par 3 course. 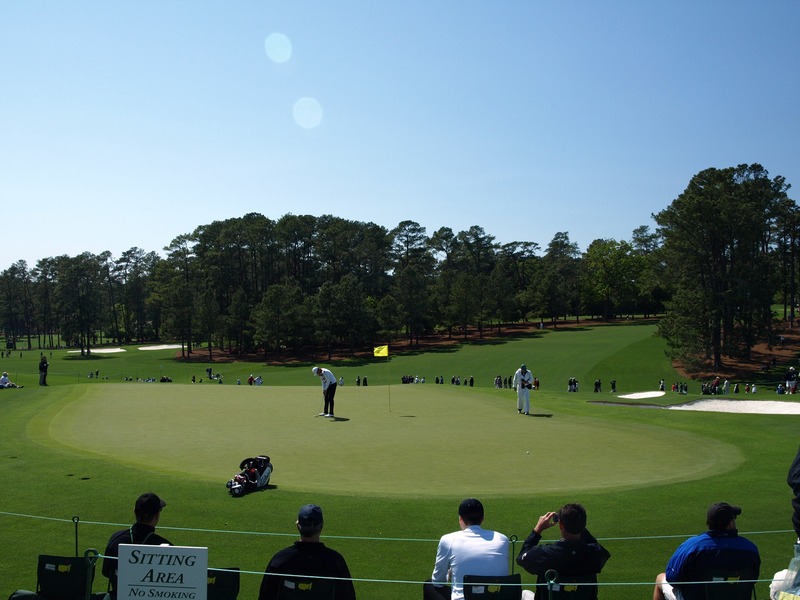 The later holds a relaxed tournament on the Wednesday afternoon, where family or friends of players, whether current or previous champions, have an opportunity to interact with the crowd and have a bit of fun. 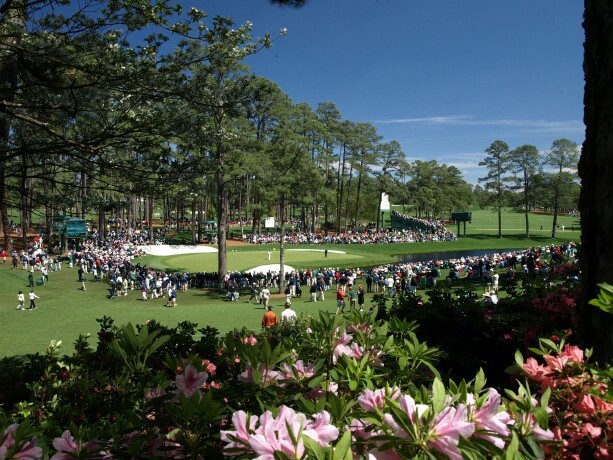 Only one issue arises, never has the winner of this contest gone on to win the Masters. The first hole is a slight right dogleg. Trouble can be found off the tee with the right hand fairway traps reachable from the tee. Those pushing left will find trees coming into play. 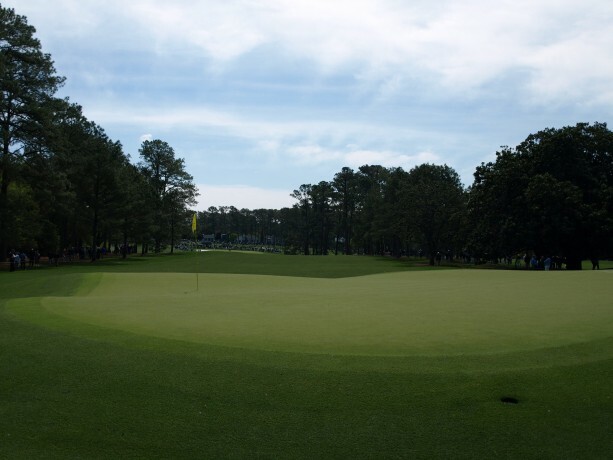 The second shot plays to a raised green which has some significant undulations, which will those shots not placed near the pin location, with a difficult two putt. 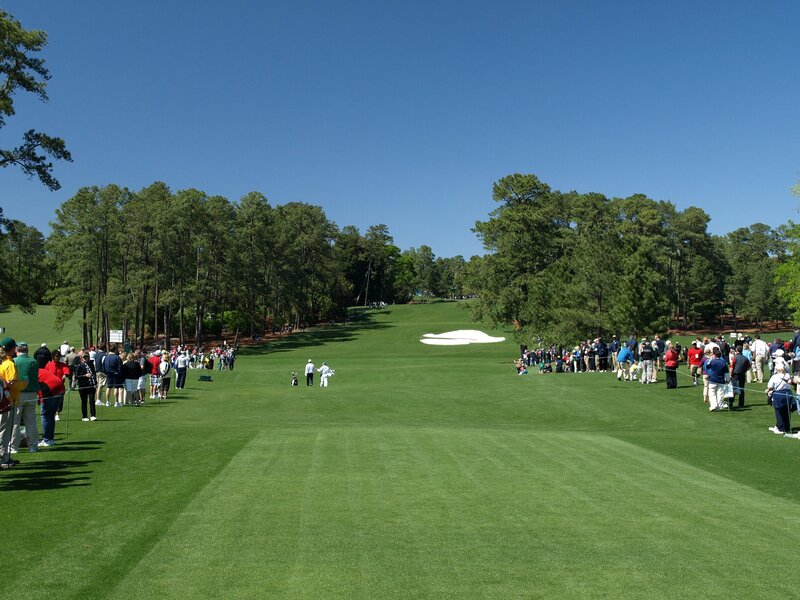 It was a great privilege to see the honorary tee off by Arnold Palmer and Jack Nicklaus for the 2011 Masters tournament on Thursday morning, well worth getting up early for. I can only dream what it would have been to see them both in their prime. These two players can still hit the ball well, with Arnie splitting the fairway down the middle halfway up the hill and Nicklaus landing a bit further up just short of the bunker. Putting this into perspective were the first group who managed to clear the bunker on the right. The second provides the first real opportunity to have some impact on the scoreboard, being a par 5 which is reachable in two. This hole has a dogleg to the left. The players will aim to have a slight draw from the tee and will be reaching the fairway bunker with their drive. Players will have a downhill shot to the green with the second. As you can see there is only a small opening to run the ball up an embankment to make the putting surface. Dependent on pin position and wind direction, some will aim to reach the green in two, bringing the two green side traps into play, but mostly players will layup and be aiming to pitch or chip close and have a single putt. The green slopes from left to right and back to front. Pin positions on the left will be easier to reach with the front opening up and ball position from the second easier to stay right due to the slopes of the fairway. Players not walking off this hole with birdie or better will be disappointed. This is a great short par 4 where players will expect to make birdie. The pin position will be key to how the players handle the hole due to the green size. If towards the back the driver could be used allowing for a short chip shot. Laying up in front of the fairway bunkers, which can easily be carried, allows a full shot to the green which could be preferable for a lot of players. 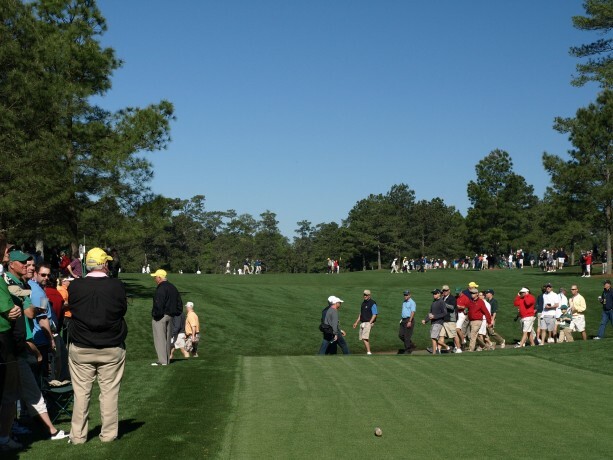 On day one of the tournament I saw a few players hit just in front of the green, but a it is easy to leave yourself in a bad position for a pitch or chip, with significant slopes taking balls to the right of the green. This is a very small green and quite tricky dependent upon the pin position. A narrow left side leaves a difficult approach. Most players will want to be long rather than short with the second shot otherwise a bogie could be on the cards. Playing long allows a relatively easy chip and run back on the green. This is a downhill shot to a wide green. Requiring a long iron, wind will be deceptive from the tee and can easily bring the bunkers into play, protecting the front and left of the green. The green is protected by a large false front, but also has significant sloping from the back to front. Playing long will make par a challenge as it will be hard to ensure the ball does not roll well past the pin. A long par 4 with a slight dogleg to the left. Deep fairway bunkers situated on the left require a carry of 288 meters, seeing players position their ball to the right of the fairway. This leaves a longer approach to the green. The green is difficult, sloping from back to front with large humps at the front, ensuring balls not carrying the distance will roll back towards the direction they came. Those not reaching the correct area of the green make par difficult and increase the chances of three putting. Hitting from an elevated tee, this hole requires only a mid iron. The slope down to the green is quite steep, with spectators positioning themselves just below the tee box. A pond was previously located in front of the green but filled in in 1959. There is a significant elevation change from front to the back of this large green. 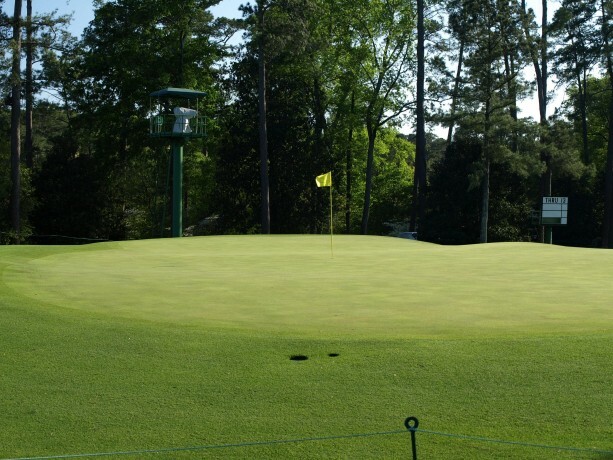 It is imperative to land the ball on the correct side and portion of the green to avoid three putting. 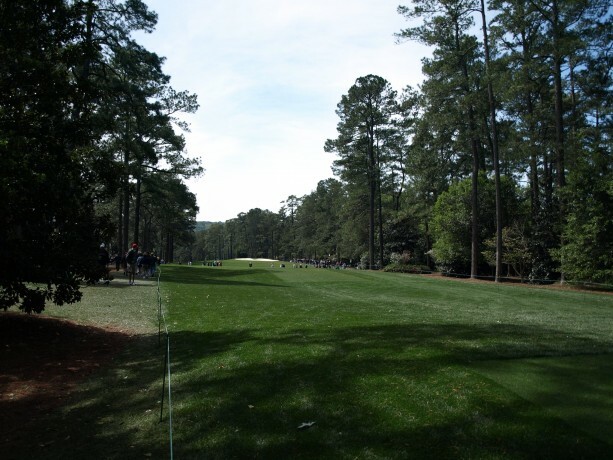 One of the tightest holes on the course, the fairway is lined with trees on either side. Players will often stay to the left of centre, leaving a second shot on a level lie. Failing to find the fairway will leave a difficult shot to find the green in regulation. Around 100 meters out from the green there is a slight uphill slope, playing to a raised green which makes the elevation appear greater. Three bunkers protect the front of the green with another two capturing any shot which maybe long. The green has some width, but is quite narrow in depth. Contours are quite significant with a few humps along the front. The undulations can make putting difficult, with sloping from the middle running down to each side, as well as from back to front. 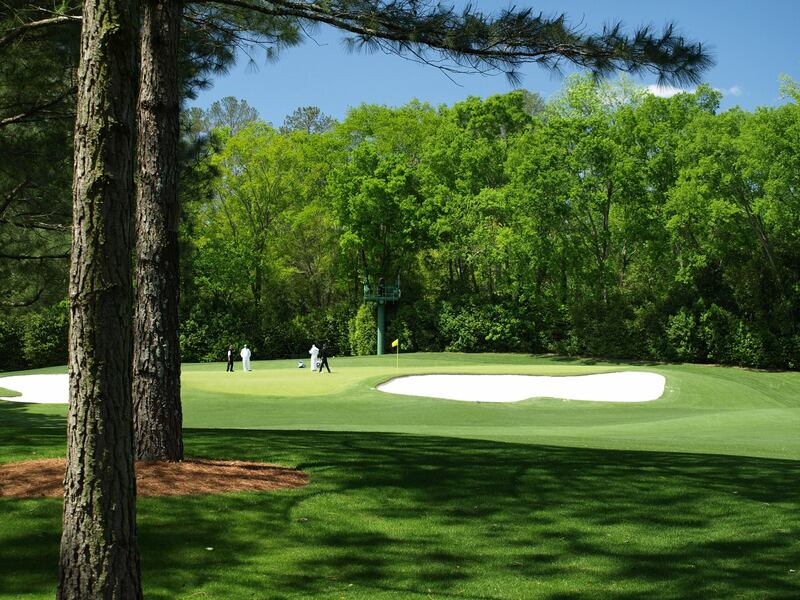 The eighth is the most difficult of the par 5 holes on the course. From the tee the landing area for the drive is quite narrow with a large bunker located on the right. 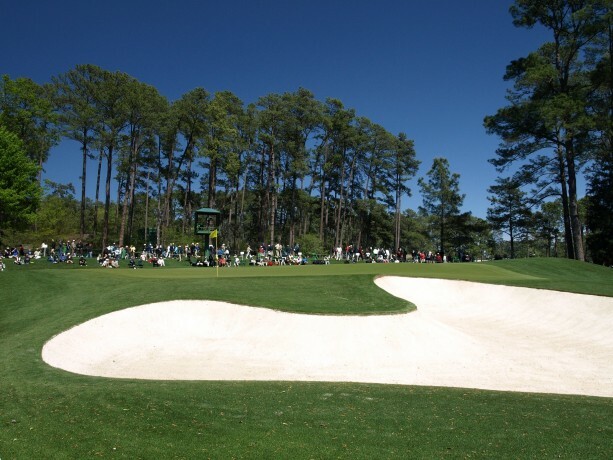 To ensure that the second can be played at the green, players will need to play as close to the bunker to get the best angle. The second shot is played up the hill with two large mounds visible at the top. For those deciding to attack the green it will be a blind shot, although the use of the mounds can be used to work out the shot direction. 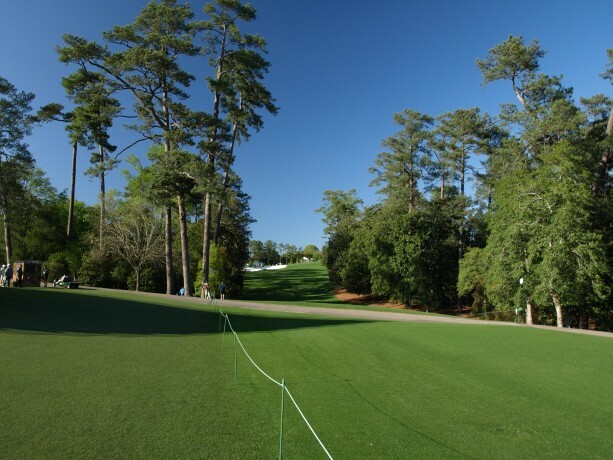 For those too far left, they will lay up to the right of the fairway to allow an easy pitch shot into the green. The eight green is quite long but narrow. If the players land left of the green they will struggle to make par as they will have to deal with the trees and mounds protecting the putting surface. 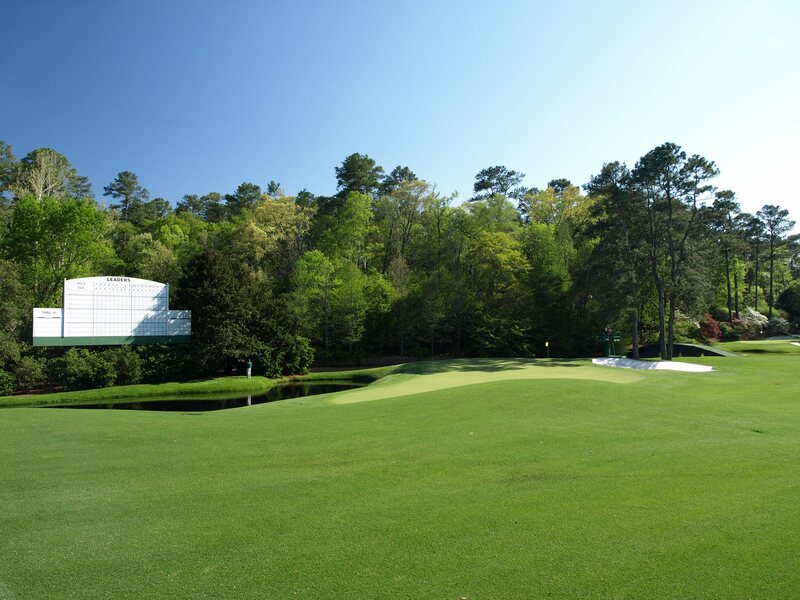 Bruce Devlin scored the second albatross in Masters history in the 1967 tournament at this hole. The many mounds which surround this green can make it difficult if the green is missed as a delicate chip will be required. These are signature elements of the Mackenzie design, which are based on camouflage techniques. 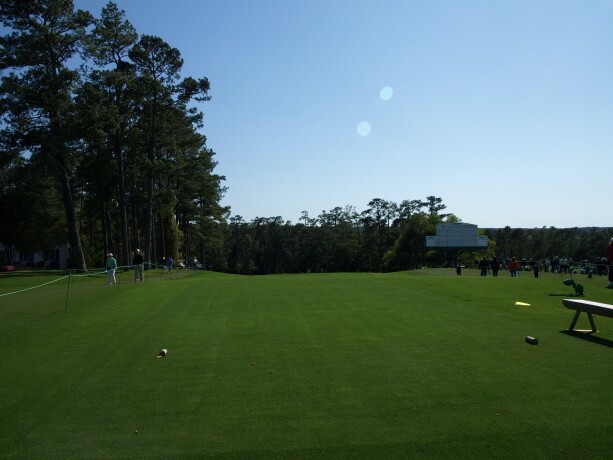 During the practice round I saw players trying to land on the large mound located at the back expecting the ball to run down to the pin position in the below photo. This actually didn’t work though, I suspect due to the length of the grass. To finish the front nine there is a dogleg left par four hole. 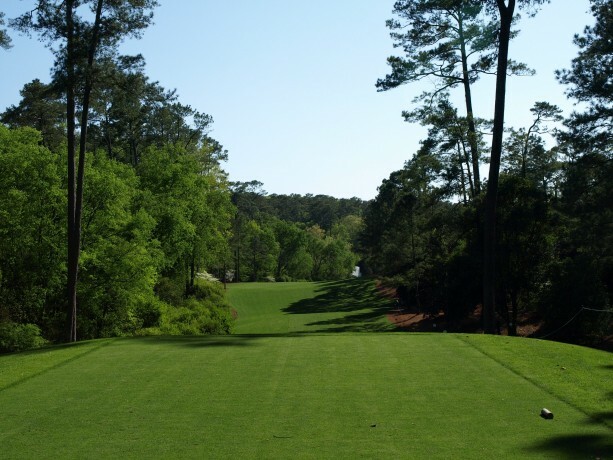 From the tee players are faced with a narrow fairway which opens up beyond the trees to a large downhill slope. Play should be to the right to try and eliminate bringing the two greenside bunkers located on the left. For those not hitting long enough play will be from a downhill lie. An old story says that Cliff Roberts had Alistair Mackenzie build a little flat spot in the fairway where his tee shots usually ended up to make his approach easier. The approach to the green is all uphill. 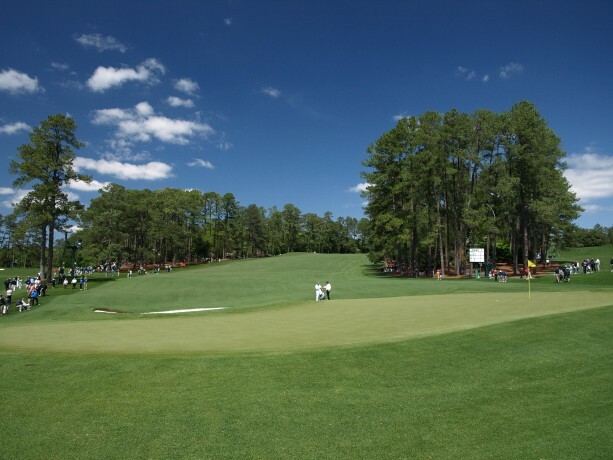 Best known for the slope of the putting surface being back to front. 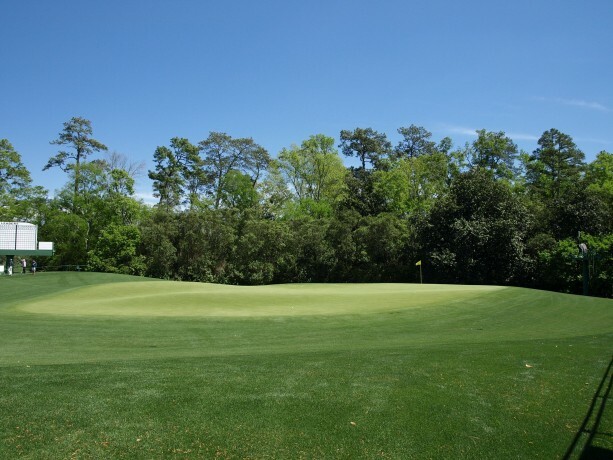 The green has a large false front repelling anything not hit to the correct distance, and also contains many contours to make the approach shot that much more difficult. The start of the back nine and in this years tournament, the scene of the Rory McIlroy meltdown. A triple bogey to loose the lead of the Masters and any chance of putting on the green jacket. 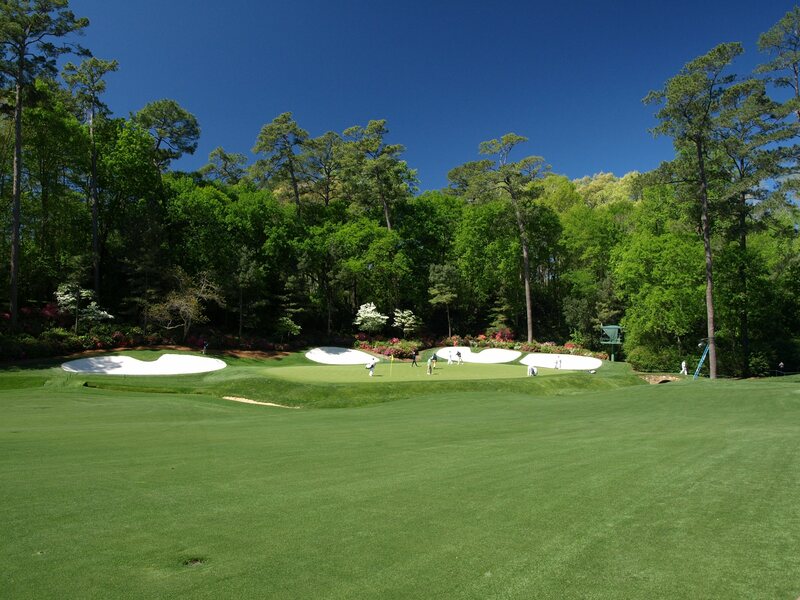 This hole starts the ride on the back nine, what the Augusta National Golf club is famous for, picturesque fairways and the toughest stretch in golf, known as Amen Corner. From the tee box, this dogleg left hole, seems to fall of the face of the earth. 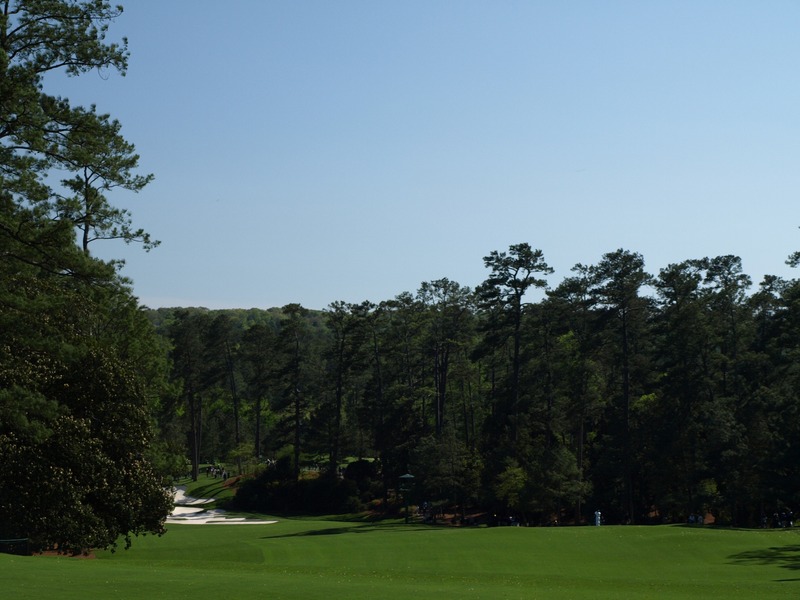 The only thing that can be seen is the top of the trees along the right side of the fairway. 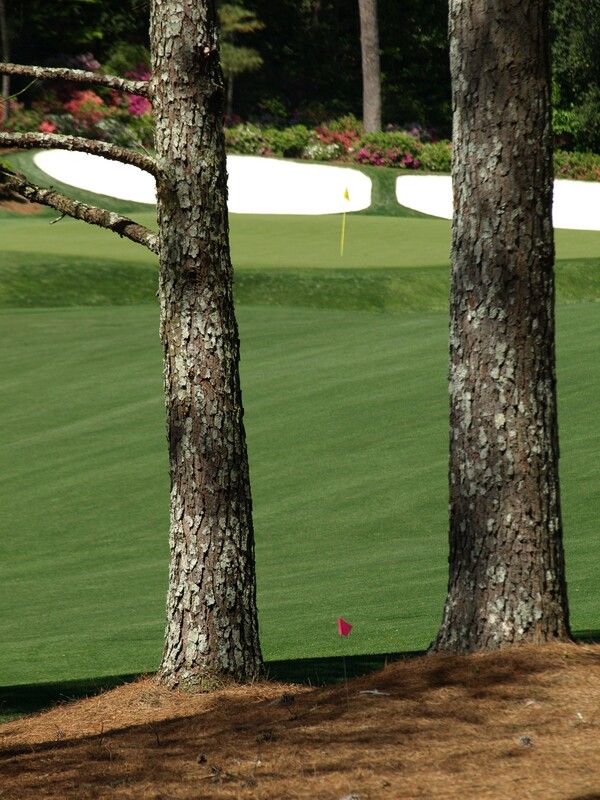 Players must draw the ball slightly or face playing their second from the pine needles. Over the years there have been many changes to this hole. In 1934 it was actually the first hole, but due to the morning fog which could be found in the lower parts of the course, it was decided to have this as the start of the back nine. 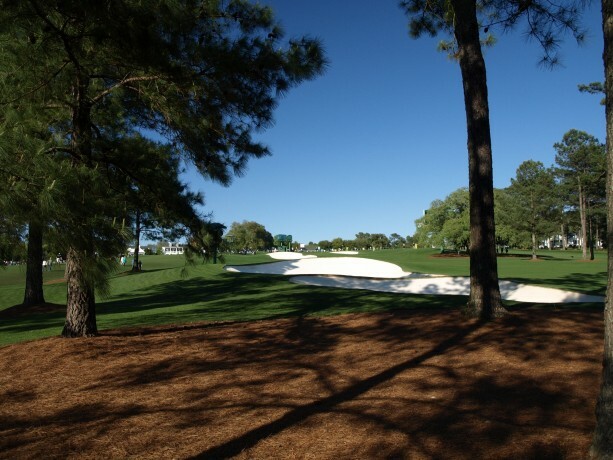 The green for the tenth was originally located partly behind but to the right of the fairway bunker. The issue with this was that rainwater drained to the green. In 1938 it was moved up the hill and further back from the bunker. As we reach the end of the teeing area we start to see how far this hole drops away. It is equivalent to the height of the Statue of Liberty from tee to green, in elevation change. There is a view of how much this hole turns to the left. It becomes evident that a shot hit straight, or even worse with a fade will find the hole lengthened, or worse trouble in the trees. It is not until we look back from the green level that we get a full appreciation for how much elevation change there is. We can’t see the tee box as it is still located around the bend. 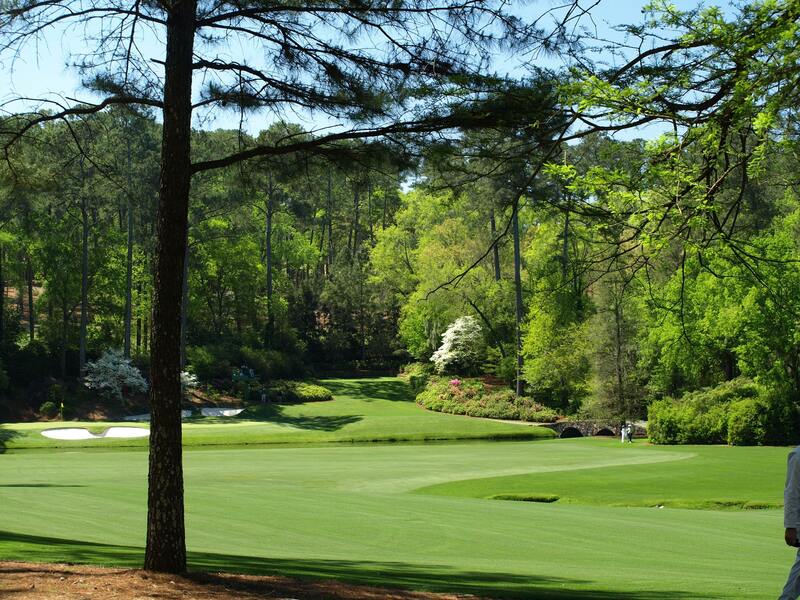 From here the action truly begins and champions made or broken, as we start our venture into Amen Corner. 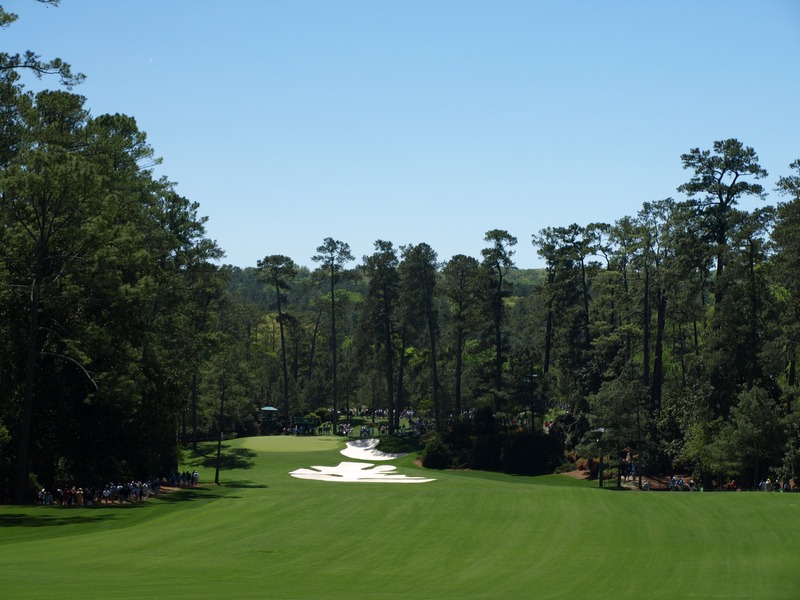 The phrase was first raised in a 1958 Sports Illustrated article by Herbert Warren Wind in trying to explain where the most exciting golf had taken place during the tournament. That place was the 12th and 13th holes. 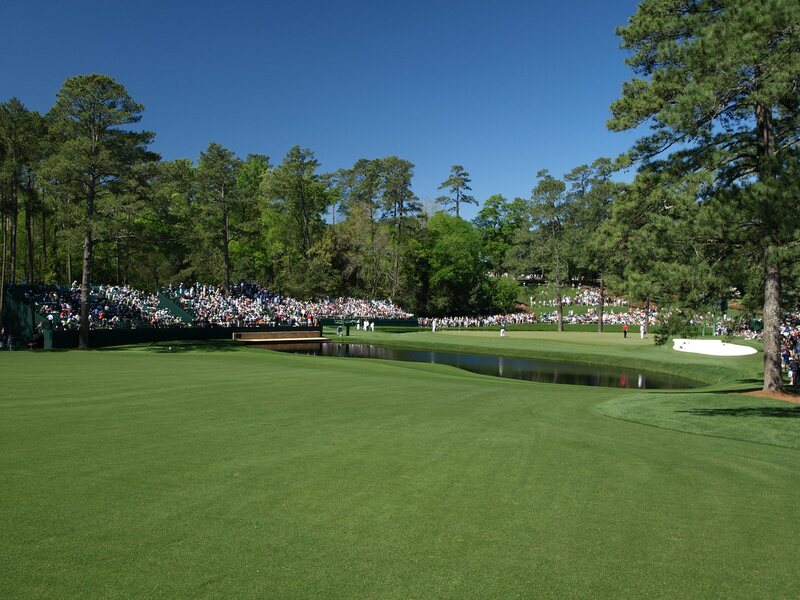 The first where Arnold Palmer had to play two balls due to a local rule introduced due to the heavy rains that soaked the course in allowing players to lift and drop any embedded ball. Officials were unsure so Palmer holed out for a 5 with the embedded ball and 3 with the free drop. 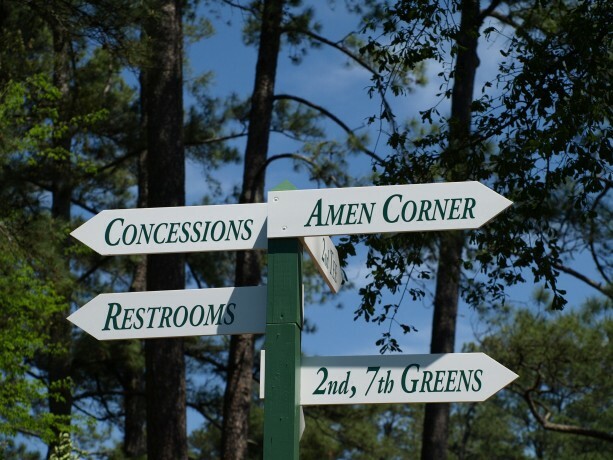 It wasn’t until the 15th hole where the good news was received that the 3 should stand. The 13th saw Palmer sink an 18 foot putt for eagle, which saw Palmer win his first major. The eleventh hole is the start of Amen Corner, well the second from the fairway to be technical. This is probably one of my favourite holes on the course. It might not have the beautiful scenery that some of the other holes have, but it requires accuracy and technical prowess to ensure par. The tee is elevated, leaving a shot through a chute of pines to a narrow fairway. It also requires the tee shot to shape left to right and plays downhill to the green. If the fairway has been safely found, the player is faced with a tough approach shot. The green is protected by a pond on the left, a large swale on the right and a bunker centre right behind the green. The putting surface slopes from left to right and back to front. 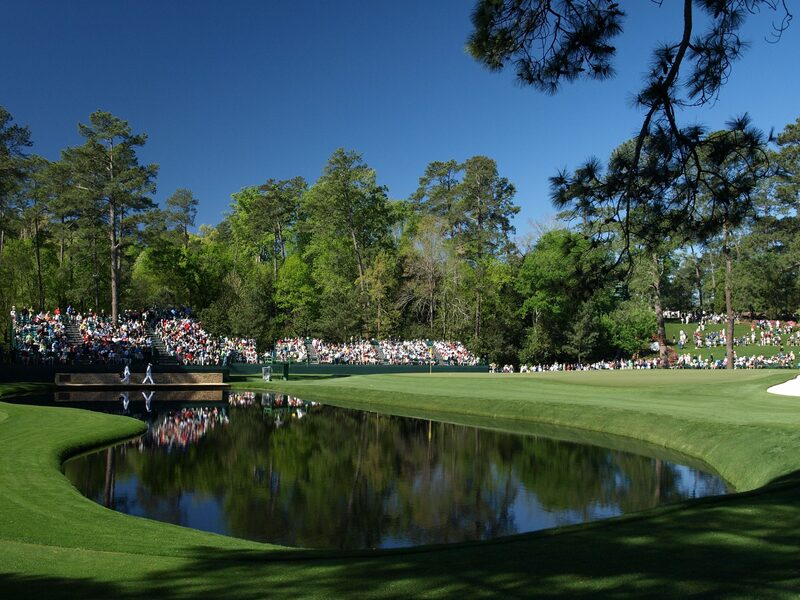 Water is always on the players mind, leaving most shots to land right of the green. The eleventh is infamous for the locals of Augusta and for all Australians. It was the hole in which Greg Norman lost the 1987 Masters in the second hole of the playoff between Seve Ballesteros and Larry Mize. Seve had been knocked out on the first hole of the playoff (the tenth), leaving Mize and Norman to battle it out. 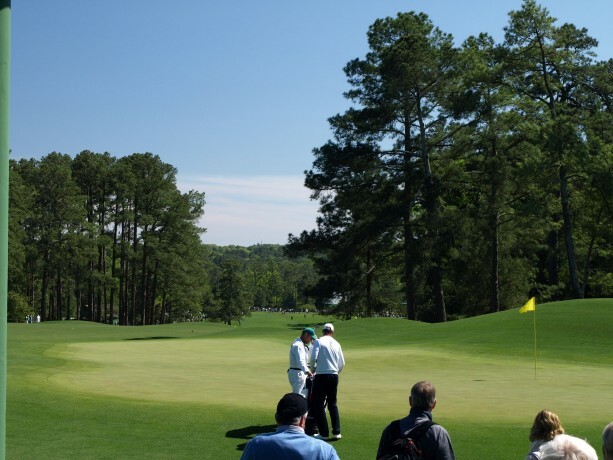 For the community of Augusta, their first local winner of the tournament sank the hearts of all Australians by making a 140 foot chip for birdie, of which Norman couldn’t equal. 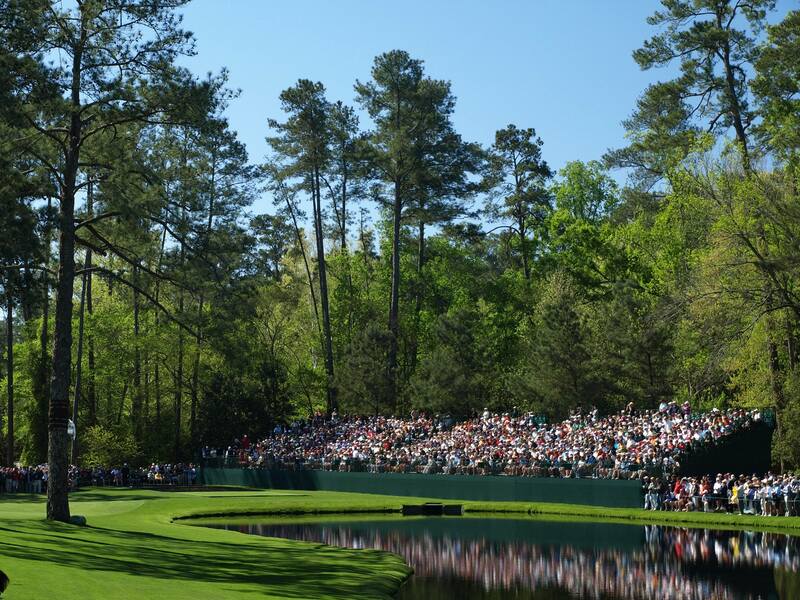 Probably one of the most recognised holes in world golf, the twelfth is a tough par 3, considering its distance. The hole is protected by Rae’s Creek at the front and three bunkers. 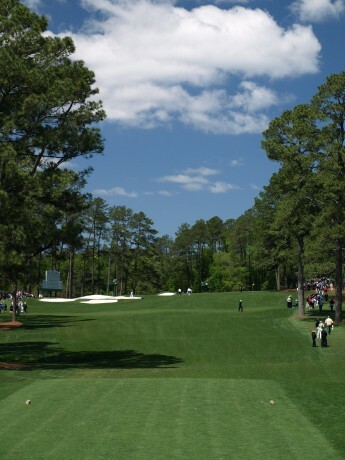 One of the most terrifying shots to play at Augusta is from this tee. Swirling winds can make it difficult to select the correct club. I saw this first hand during the practice rounds and the competition. Any player managing to find the creek or bunker, saw other players in the group checking and sometimes changing club selection to ensure they hit the green. The Ben Hogan Bridge, located to the left of the green, was built in 1958. It was dedicated to the man who won his second Masters in a record score of 274. More renowned for its beauty, with pines and azaleas serving as a backdrop to the green. The green is the narrowest on the course and a hard target to hit. Three bunkers protect the green, one at the front and two at the right rear. Any shots long are difficult. Holding the green on the return shot could easily find the ball rolling into the front bunker or even worse, into Rae’s Creek. 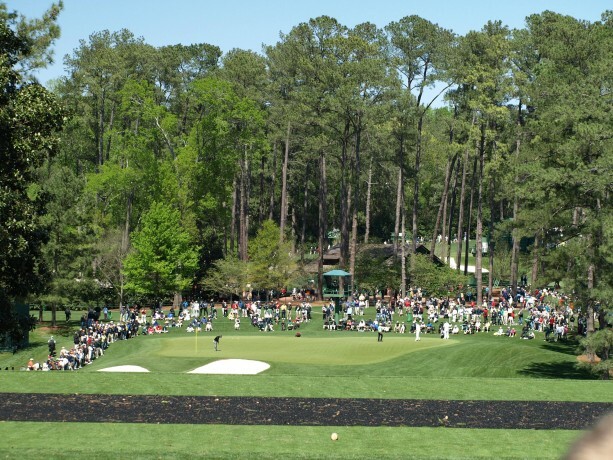 The twelfth is one of the most popular spots for spectators during the tournament, along with the sixteenth. 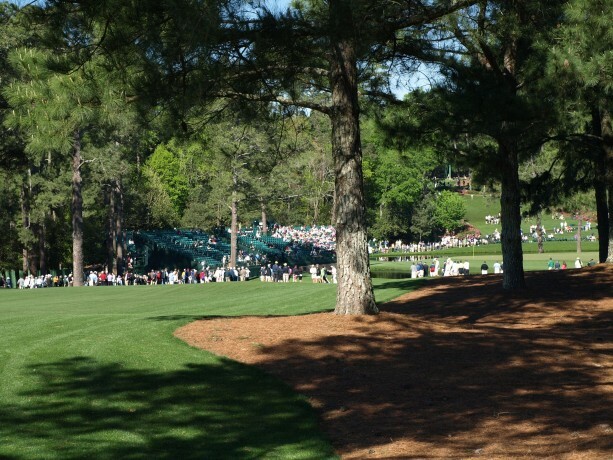 Crowds roar with shots anywhere near the pin and can be heard throughout the whole course. 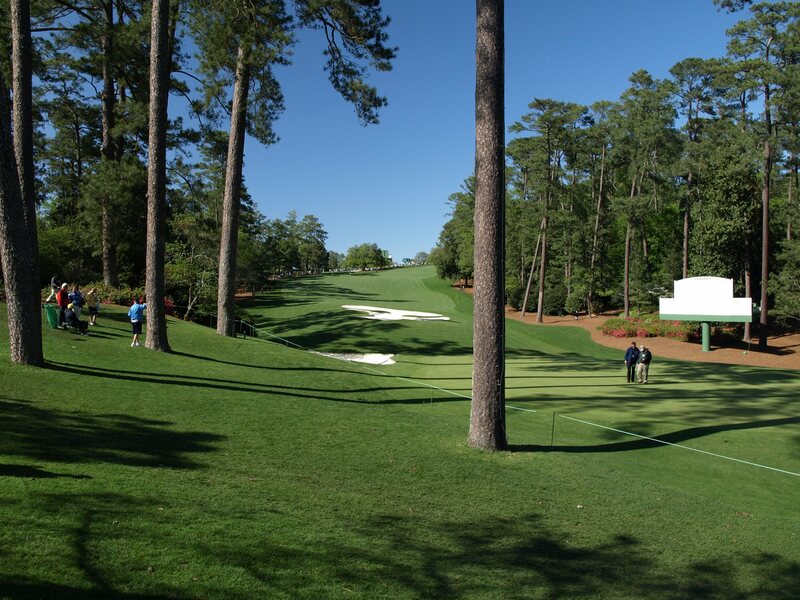 The tee shot of the 13th, completes Amen corner. This dogleg left par 5 hole is not overly long for the professionals, but requires some accuracy from the tee to avoid trouble. From a raised tee the players must hit across Rae’s Creek, avoiding a a tributary running along the left side of the fairway. This leaves many players to play to the right of the fairway, which brings the trees into play. The landing area for the drive is banked from the right to left. Players cross the Byron Nelson Bridge to reach the fairway from the tee. This was dedicated to him in 1958, in recognition of his magnificent play at holes 12 & 13 (scoring a birdie and eagle respectively to pick up six shots on the leader) in the 1937 Masters of which he won. 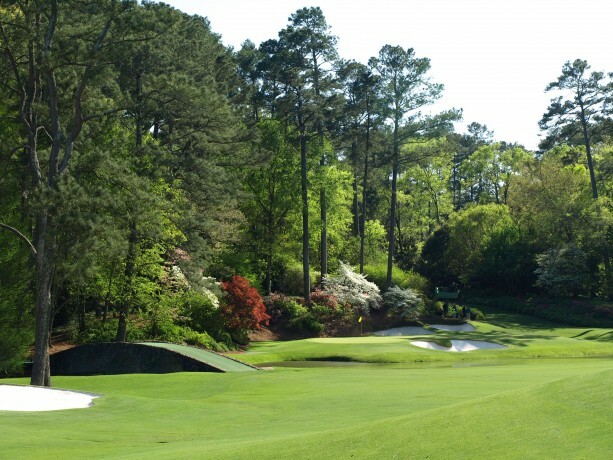 The 13th hole has been scene to many triumphs and disasters over the years. This was evident during the 2010 tournament. 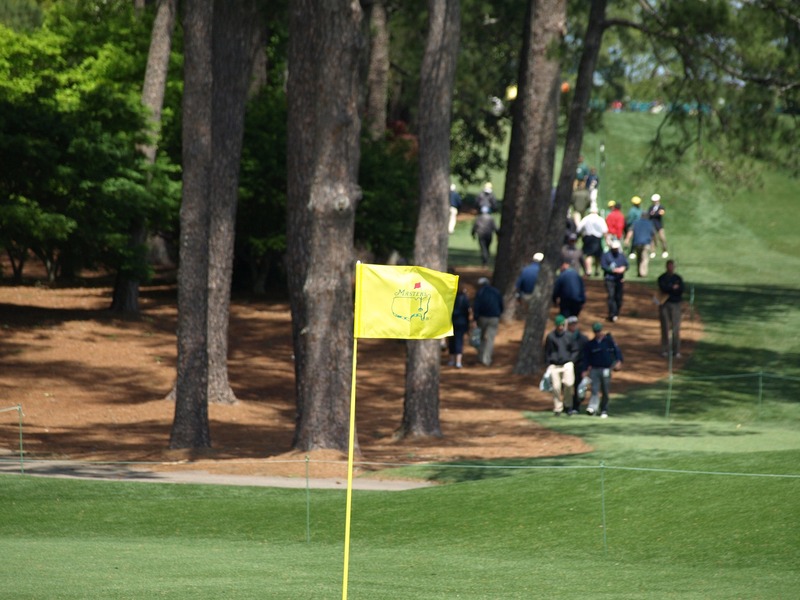 Avoiding the trees and pine needles on the right of the fairway is critical to allow an attacking shot to reach the green in two. Phil Mickelson defied the odds during the fourth round while holding a one shot lead. Going against his caddies advice to play his second shot safely out to the fairway, after playing his tee shot into the trees, he was left with a 187 meter shot to the green. Having to navigate a narrow gap between two trees, he nailed the shot landing 4 feet from the pin making a birdie, which ensured victory in the tournament. 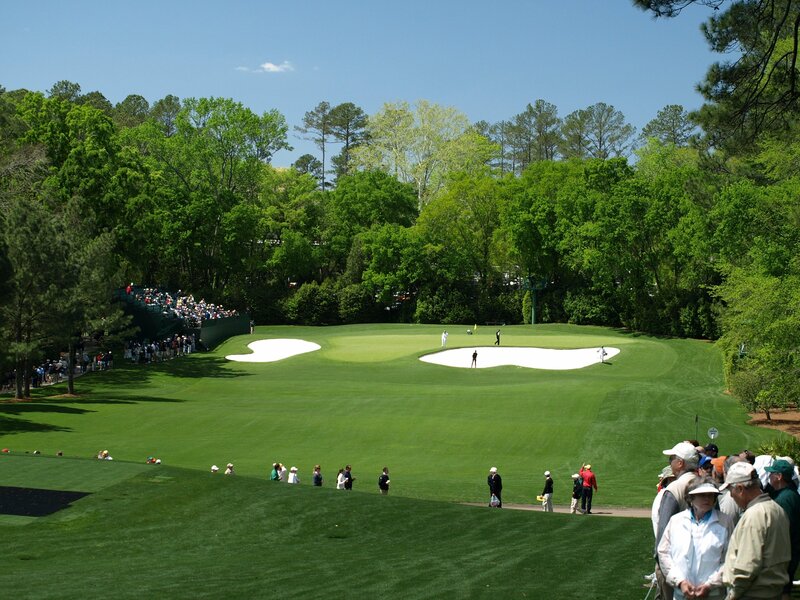 Those who manage to find the fairway need to decided if they should try and reach the green in two, or layup, taking away the danger of the creek running in front of the green. 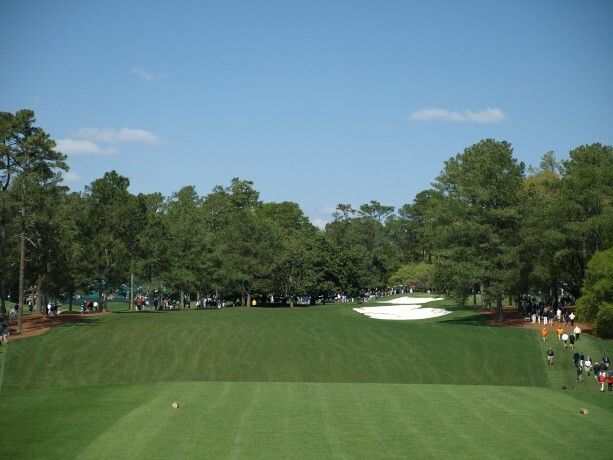 Surrounding the back of the green is four bunkers, but a small hollow in front of these will usually capture any long shot running through the green. Chipping from this area can be treacherous with the slope running from the back down to the creek. The 13th has approximately 1600 azaleas from tee to green. It is truly one of the most beautiful holes of parkland golf, as well as one of the most strategic. 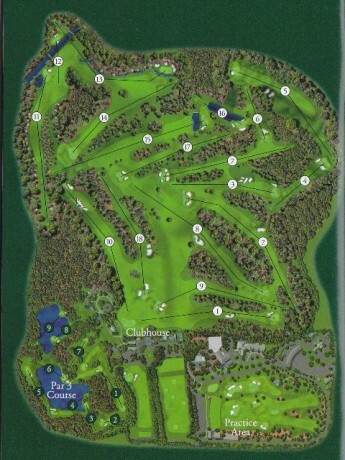 It has also been rated in the top 18 holes of golf in many publications. This hole is a slight dog-leg left and the only one on the course without a bunker. 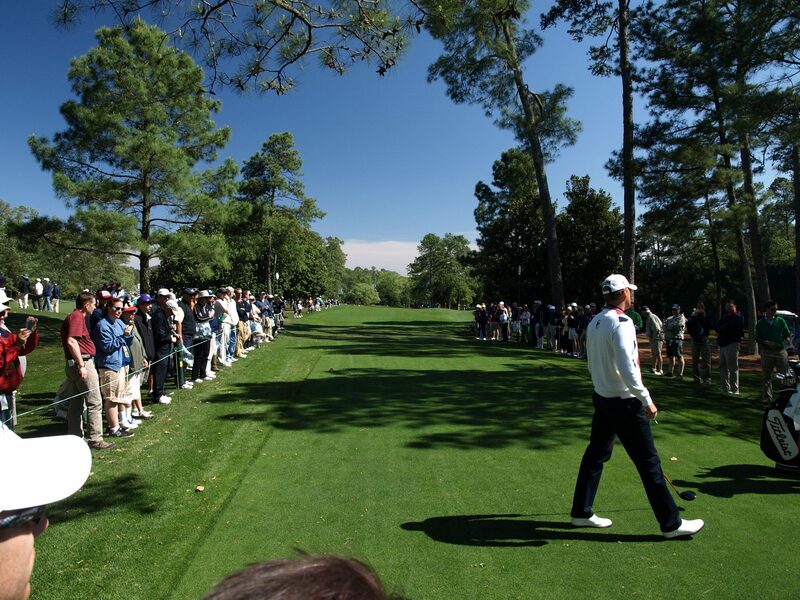 The preferred line is to hit slightly left to allow the slope of the fairway to take the ball right. Longer hitters will manage to carry the hill but the majority will play slightly short of it. Anything left near the trees will make the approach difficult. This is one place to ensure you have a clear approach as the green is very difficult. The green is protected with various mounds and contours at the front, but also terraces down from the left side to right. Any pin position on this green which are short right or long left are extremely difficult to play. One of the easiest holes on the course, but also one which provides a lot of drama. 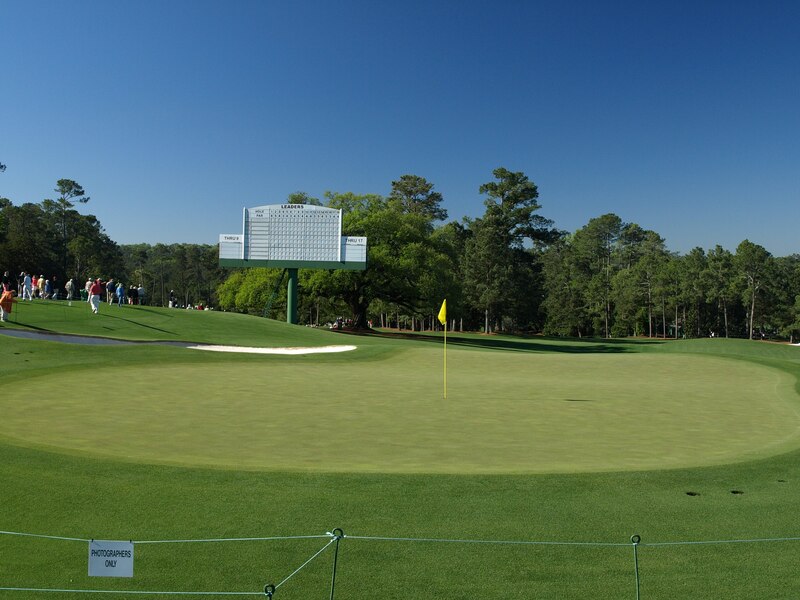 This par 5 hole provides the players with their last real chance of making a late move on the scoreboard. There is plenty of room to land on the fairway, but anything down to the left side, will see making the green in two almost impossible. 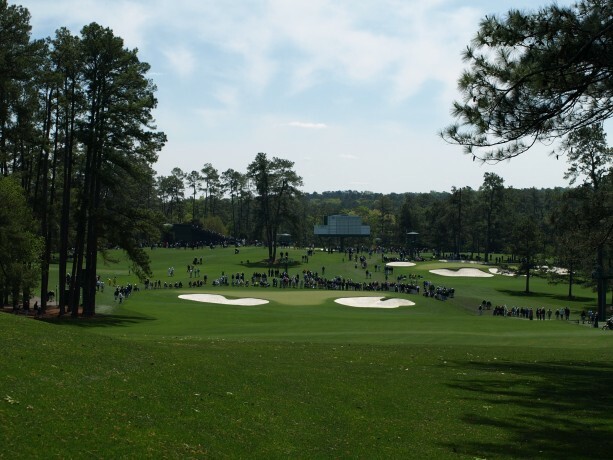 Those reaching the hill to the right, have a clear shot at making the second stick on the green and a chance for eagle. The below picture shows the distance the players would have for their second. Carrying the pond is obviously critical and also avoiding the bunker to the right of the green. A great shot here can see a last minute surge up the leader board. For those laying up they are left with a wedge shot to the green. Sounds easy, but you are playing from a downhill lie and too much spin can see the ball roll back into the water. Anything over the green and the chip shot back will be difficult, this green slopes from the back to the front, bringing the water back into play. Growing up I remember so many shots having enough back spin to come off the green, then roll down the hill and into the pond. It seemed that the grass was a little longer this year as not as many balls seemed to roll into the depths of the pond. This certainly wasn’t the case for Gene Sarazen in the 1935 tournament. “The shot that was heard around the world” was Sarazen hitting his second in for an albatross. On the 20th anniversary of this event, the bridge leading into the green was named dedicated to him. This hole is a all carry over water, so if the player is in contention it is one shot which will test their nerve. Anything long will test the chip shot back, although in 2005 Tiger Woods managed his dramatic chip in which allowed him to tie with Chris DiMarco before winning in the playoff. 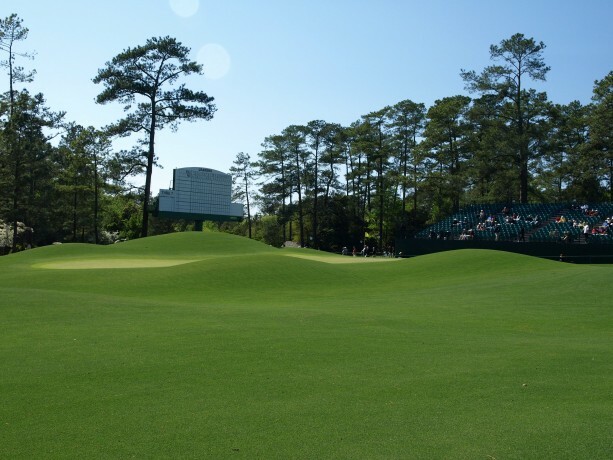 Protected by three bunkers, the green severely slopes right to left. Typical pin placement is shown in the photo below for round 4 of the tournament. This allows a lot of balls to funnel down close to the pin. 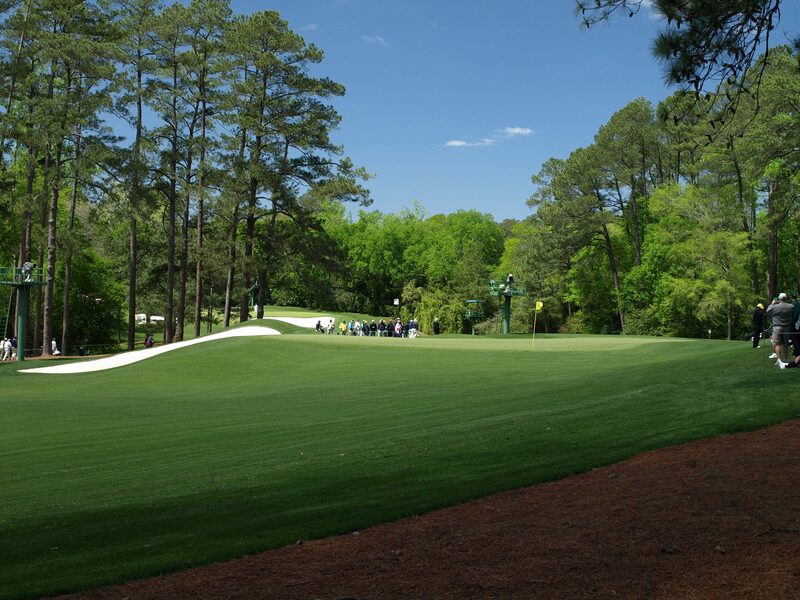 One of the toughest pin positions is the short-right side of the green towards the front, which is raised on the hill. This leaves only the most accurate shots with a chance for birdie and brings the forward bunker into play. 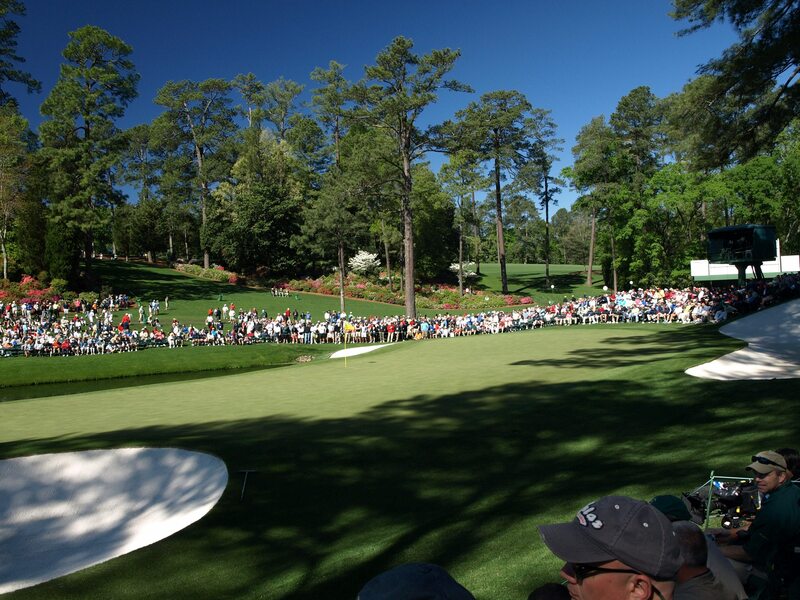 There is always guaranteed to be large crowds around the 16th green. During the practice rounds players will try and skip their ball across the water to the green. Those not partaking are jeered by the crowd, whilst those being successful will receive a loud cheer. 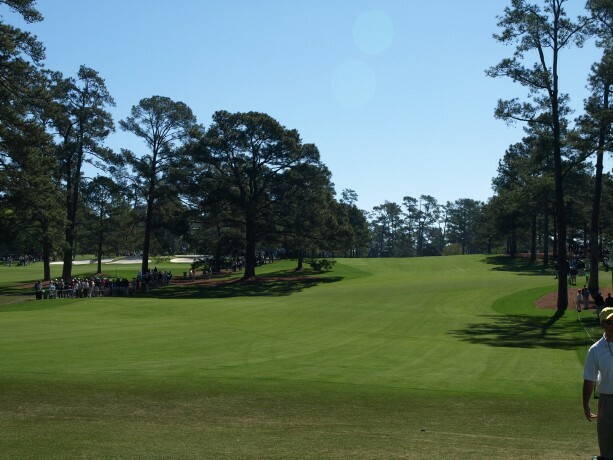 The seventeenth is a predominantly straight hole with a slight uphill tee shot. 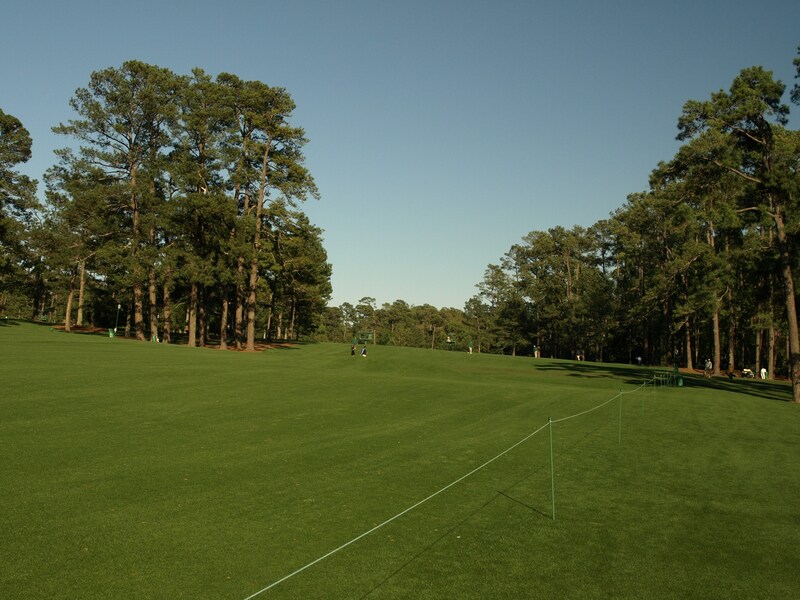 The fairway is lined with trees with one famously large one left centre of the fairway, known as the Eisenhower Tree, after the US President. This loblolly pine is between 100 and 125 years old, standing at a height of 65 feet. He hit into the tree so much that he often campaigned to have it removed, with one club meeting Cliff Roberts ruling the president out of order and adjourning the meeting. 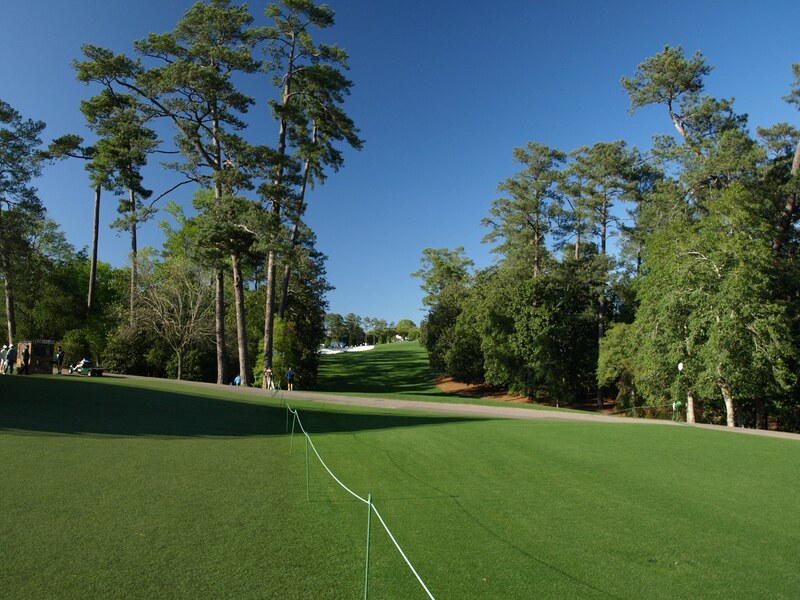 The preferred line into the green is from the right of the fairway. 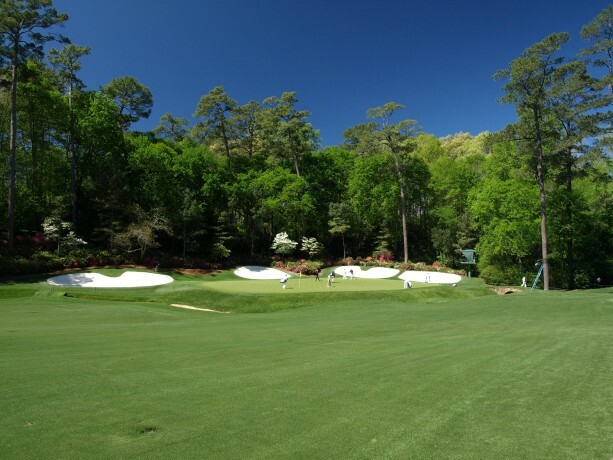 This green is protected by two bunkers on the front face, whilst the back of the green slopes away. 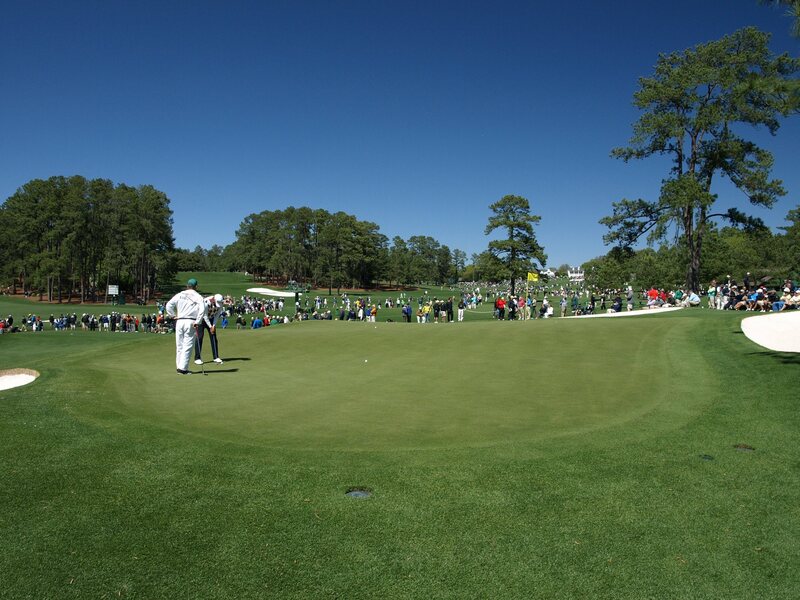 The putting surface of the 17th is probably the most underrated on the course. An extremely firm green will make finding the ball stay near the pin difficult. The undulations can cause the putts to be elusive. A spectacular and challenging hole to finish the course. 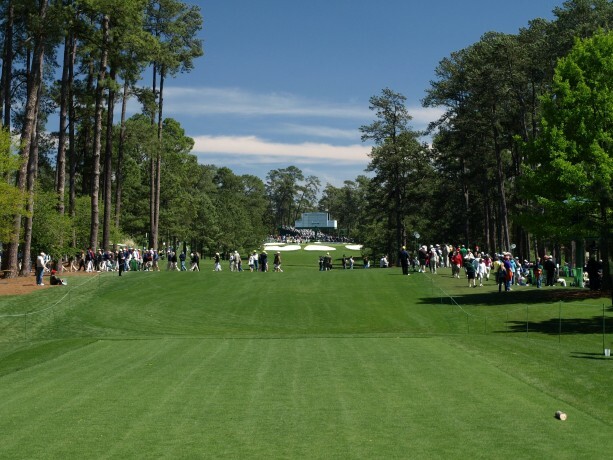 This uphill dogleg right has players hitting their tee shot through the chute of trees leading to the fairway. 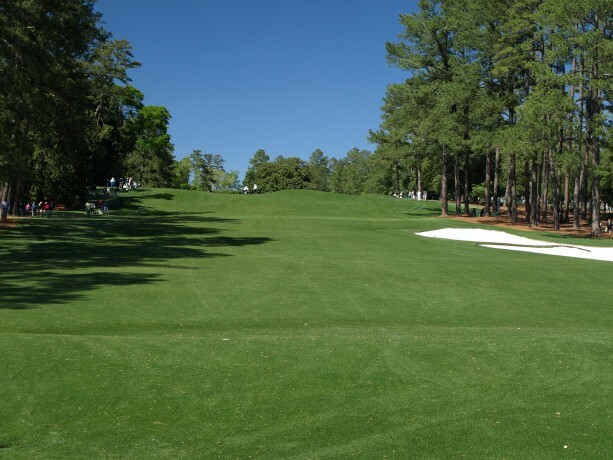 Being uphill makes the hole play much longer than its 425 meters. There has been many championships decided on the 18th. 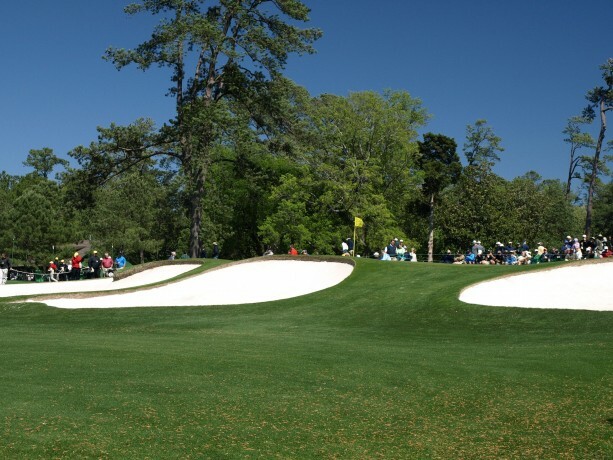 The fairway bunkers are in play with the driver for most tour professionals. Most play a 3 wood to ensure they land on the fairway. Those playing too far right on the fairway will find their approach shot blocked by the right side trees. 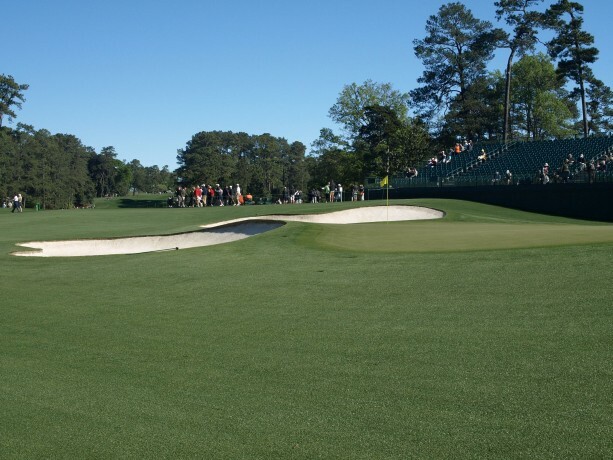 This two tiered green is protected by two bunkers at the front and come into play on forward pin positions. Playing too long on this hole leaves a difficult chip as the slope is from back to front. This is another popular spot for spectators, with the officials providing plenty of seating area around the green. Overall this hole has an elevation rise of 18 meters, only the tenth has a greater change. 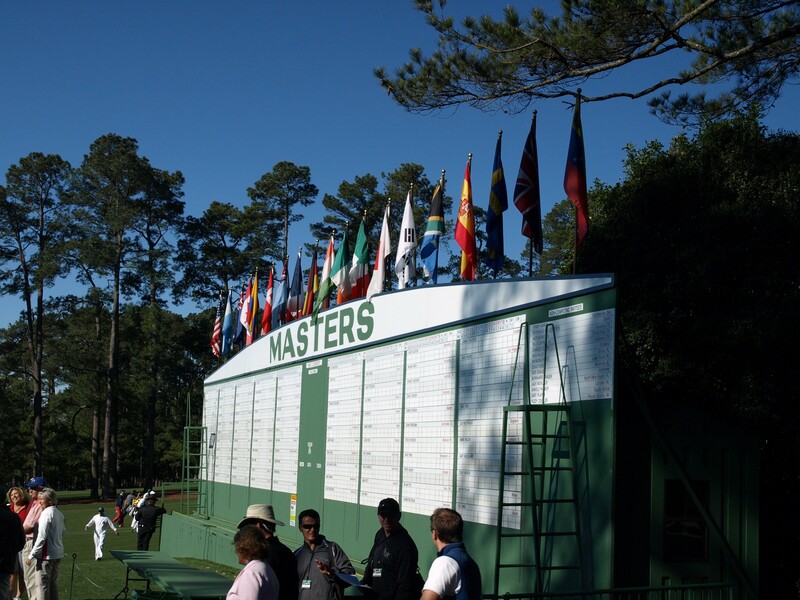 The main scoreboard is located to the right of the first fairway. Here you can find the progress of any player in the tournament. 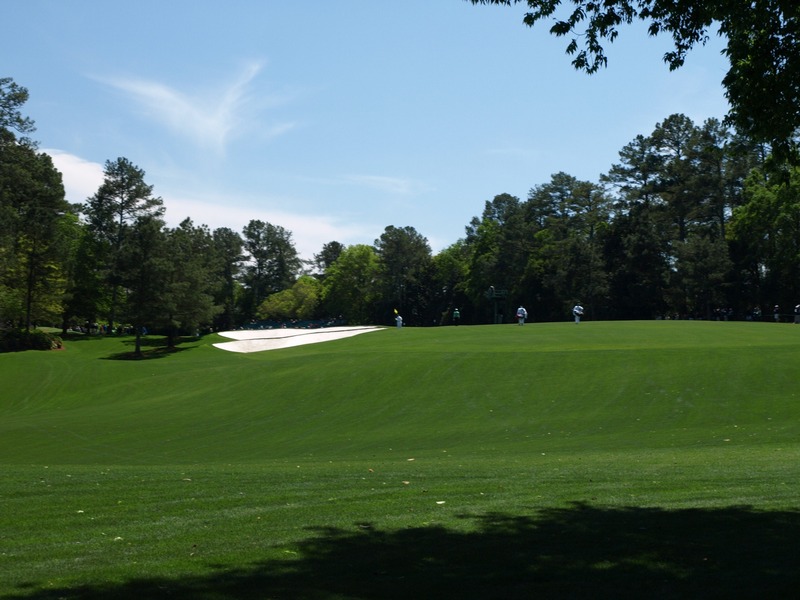 Even though I have not been lucky enough to play Augusta National Golf Club, it was still a great experience to wander the grounds during the tournament. I blocked out the other fifty or so thousand who were present and submerged myself into the atmosphere. Certainly one of the greatest golf clubs in the World.